Curt Schilling, the elite meme curator and former MLB pitcher made famous by refusing to recognize when he didn’t have a leg to stand on, said that he is considering a run for the United States Senate in 2018. This is not a new claim from him. If this plan sounds familiar, that’s because Schilling has brought it up before. His political involvement—beyond retweeting conservative image macros—stretches back to nearly a decade. In the 2008 presidential election, Schilling stumped for Sen. John McCain. (He had also voiced his support for George W. Bush in the 2004 election, hours after the Red Sox had won the World Series.) He appeared at an event in New Hampshire in 2007 to voice his support for the Republican candidate. “Let’s put the right human being in the White House, not the best politician,” Schilling said. Schilling had surgery on his shoulder in the summer of 2008 and admitted that his baseball career was likely over; Barack Obama won the election that fall. Schilling officially retired in March of 2009. But Schilling confirmed he had been contacted. Taxes? Sure I’ll pay them, regardless of the number. Would I prefer lower taxes? Sure, who wouldn’t? But I’ll pay, whatever they are, because that’s the cost of being able to live in this country and I’ve never had a problem with that. Having said that I live in a state where I can’t drive 1/2 of a mile without a torn up road, or on a major highway without paying a toll, a large toll. How in the hell is this state broke? How in the hell has a state with supposedly as intelligent a voter base as Massachusetts allowed itself to be run into the ground by entrenched and often times corrupt ‘me first’ politicians? How did that happen? All the way down to the community level our papers are littered with stories, daily, of unethical behavior, scandal and outright criminal acts, BY OUR ELECTED OFFICIALS!. A run for the Senate is a massive undertaking, both personally and financially. I’m not even close to a Rhodes Scholar or Ivy League graduate, but I also know I’m watching many people with those exact credentials run this state, and this country, into the ground. You don’t need either to serve the people of the commonwealth, what you need is an unbridled and unattached passion to change peoples lives for the better. You need to not be beholden to all of those groups that offer the ‘we pay now, you pay later’ handout. I have no idea if I’ll even do this, but if by some slim chance I do it won’t be a joke, and it won’t be for laughs. These are deadly serious times at home and abroad and this country absolutely has to elect public servants who don’t head to Washington with an “Out of sight out of mind” approach to us living back home. 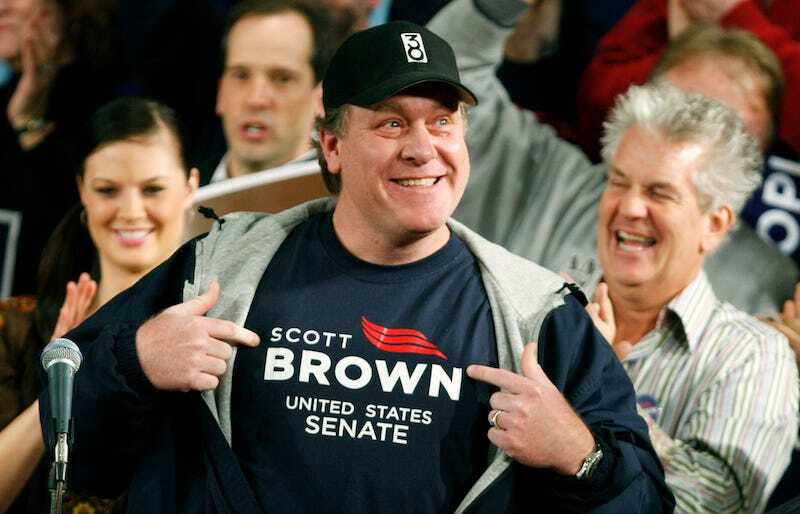 In January of 2010, Schilling endorsed Republican Scott Brown in the Massachusetts senatorial race over Democrat Martha Coakley. Almost two weeks later, Coakley brushed off the pitcher’s support of her opponent by calling him “another Yankee fan.” This joke did not land. Schilling repeatedly crossed the line with his memes—what a dumb sentence to write—and ESPN fired him in April after he shared an anti-transgender image to his Facebook page. Roughly seven years ago, Schilling had his video game company, Rhode Island willing to give him a loan to settle his venture in the state, and an encouraging outlook on his post-MLB life. Now, Curt had no job, no cash, no hope, and a lot of free time that could be used to truther train crashes. That’s how we get to current-day Curtis Montague Schilling, a bitter man who supports Donald Trump and drinks cream soda while fielding questions on livestreams. He said multiple times in August that he’d mull over running for office. “State office first, White House in 8 years,” he wrote on Facebook with a smiley face. He talked about it today. He’s been saying it for years. But Schilling has his podcast to tend to and his memes to share, and Shonda still has to say yes. Until he actually files papers to run for Senate, it’s all bluster. Here’s a helpful link if you’d like to bookmark it, Curt.